If you’ve ever been questioned by a police officer, you know how intimidating and nerve-wracking the situation can be. Whether or not you have broken the law, you don’t want to be taken advantage of and you definitely don’t want to have your rights violated. Here is an overview of your basic rights in common situations so you can feel protected when interacting with the police. If a police officer signals you to pull over while you are driving, stay calm. Safely pull off to the side of the road as safely and quickly as possible. Even if you don’t know why you’re being pulled over, always be polite and cooperative with the officer. This will lead to a more comfortable, respectful interaction. Roll down your driver’s window and have your driver’s license, insurance, and registration ready to give to the officer when he asks. If the police officer asks you for consent to search you or your vehicle, you have the right to say no. However, there might be times when the officer does not need your consent to search and will search anyways. This may happen when the officer already has a warrant to search you or your car, the officer plainly sees evidence of a crime in your car, or if he has other probable cause that you have committed a crime. The officer may ask you to step out of your vehicle. If this happens, follow his instructions and cooperate with his requests. But always remember that you can invoke your right to silence. If the officer asks you to step out of the car, there’s a chance that he might quickly pat down your clothing. He’s allowed to do this for his safety if he “reasonably believes” that you have a weapon on you. He does not need your consent to conduct this frisk. If he does pat you down and you have a weapon, he can take that weapon from you. But you have the right to challenge this search later in court if you think there weren’t any facts that suggested you were carrying a weapon. People generally think that if an officer talks to you on the street then you have to answer his questions. That is not true. An officer can approach or stop you to ask you questions even if they don’t think you’ve done anything wrong. This is called a “consensual encounter.” If this happens to you, you have a lot of options. You do not have to identify yourself, answer any questions, or consent to a search. You can also leave anytime you want. Police generally don’t inform you that are you free to leave at any time. Therefore, it’s usually a good idea to make sure you can leave by asking the officer if you are free to go. If you are talking to an officer and reasonably feel like you are not free to leave, then you are being detained. The police can detain you if they reasonably suspect that you have committed a crime or are about to commit a crime. If you are being detained and the officer reasonably suspects you are carrying a weapon, the officer can frisk you to make sure that you are not armed. You do not have the right to refuse this frisk. However, you still have the right to remain silent. Can a Police Officer Search Your Cell Phone When You Are Arrested? Until recently, an officer used to be able to search your cell phone when he arrested you without a warrant. But now after a recent United States Supreme Court decision, police can no longer do this. Officers must now get a search warrant before they search your cell phone. If you are arrested and see an officer searching your phone without a warrant, do not act out against the officer or resist. Instead, just make sure you tell your attorney as soon as possible. There are several situations where an officer can legally search you or your belongings. If you consent to a search, then the officer can legally search the area to which you consented without a search warrant. An officer can also search you, your house, or your belongings without your consent if he has a legal search warrant. Lastly, when an officer arrests you, he can legally search you and the area immediately around you without a warrant. Firstly, never resist arrest – even if you think you think that you are being wrongly accused or arrested. If you struggle, the prosecutor can charge an additional crime against you. Therefore it is in your best interest to always cooperate with the arresting officer to the fullest extent possible. Once you have been arrested, two constitutional rights kick in: the right to remain silent and the right to an attorney. Ultimately it is up to you if you want to invoke these rights and it varies from situation to situation. If you want to invoke your right to an attorney but do not think you can afford one, still invoke your right. A lawyer will be provided to you if you cannot afford legal services. If you have invoked either one of these rights and the police continue to answer questions, simply repeat that you want to invoke your right to silence and right to an attorney. 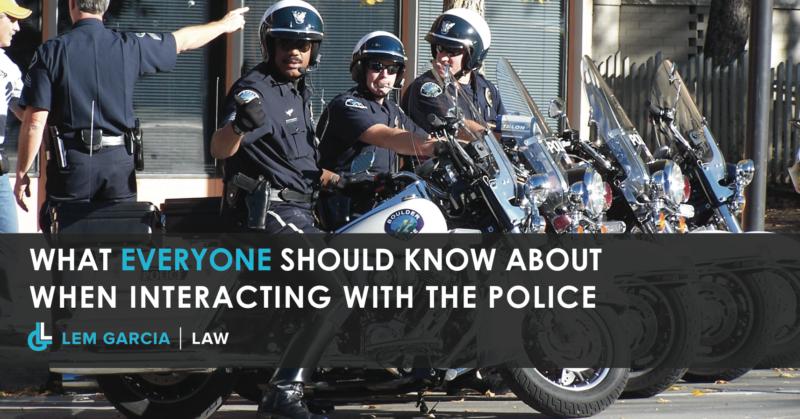 The police cannot keep questioning you if you have invoked your right to an attorney, and therefore cannot continue to question you without your lawyer. You also have the right to make a phone call and can ask for this phone call at the police station. If you ever feel like a police officer has violated your rights, West Covina attorney, Lem Garcia, may be able to help you. If you have been a victim of police abuse, give Lem Garcia a call at (626) 337-1111 or text at (626) 252-2168.